Another company that has tried to help automate posting to Facebook, Twitter, and other social media platforms announced today that it’s quitting. Postrocket is shutting down on August 15th. This leaves HootSuite, Buffer, Sprout Social, Social Bro, and others in the field. So, it’s not exactly like social media players won’t have any options. But, I had picked a favorite tool, learned it, and used it. And, now it’s gone! But, I guess I am going back. HootSuite is $10/month and other options for my size of business are several times more. BTW, a good comparison of tools I found was this May, 2013 WordStream posting. This is really disappointing to say, but I must inform you that PostRocket will be shutting down its products and services next Thursday, August 15th. Right off the bat, I’d like to ensure you that you will be refunded any remaining credits by filling this form out. When we first started PostRocket, we wanted to not only help marketers like you succeed in Facebook marketing, but do so with an exceptional product and service to back it. We were never able to reach the high bar we set for ourselves. Our product had many issues and even through the down-time and bugs, you stuck with us and even became paying customers. We thank you for that. We should and could have done much better in bringing you a reliable product that expanded as quickly as the landscape of Facebook marketing changed. You will be refunded any of your remaining prorated credits as of today 8/6/13 and will be able to continue using PostRocket to migrate your data or find another provider until 11:59PM PST 8/14/13, at which point all data will be erased and removed. If you’re looking for an alternative service to migrate to after PostRocket, I *strongly* recommend using Facebook’s all new native Insights product. I would have never recommended using native with FB marketing, but their new product blows any other service out the water. They are rolling out this Insights product and you should expect to receive it in the next few weeks, if you don’t already have it. Again, thank you so much for being a PostRocket customer. We really do appreciate you believing in us. We wish we could have done better for you. Run this Again, … It’s Important! Repeating a story is unwanted by readers, bad for the publication, and also bad for the activity being promoted. Readers know when they’ve seen something, and they will keep checking the newsletter — or listening to in-person announcements — only when they are being exposed to new information. Repeating the same words week-in and week-out because it is “important” is unlikely to get more participation. People tune out old news, and if there is a lot of old news in the publication, they’ll stop reading it completely. Moreover, repeating the same words another time has a diminishing impact on the reader. They have already seen that come-on one time, made their decision not to join in, and repeating the same “come on down” message is not a good way to get them to change their mind. Your invitation to participate has to be fresh each time you give it! If you are working on a major or ongoing event you can tell people about what you’re doing repeatedly. Just give a different focus for each of your stories. The organizers of the annual pledge drive ask a different person in the organization to write what the group means to them and to explain why they are giving generously. The message of (“GIVE!”) is consistent, but each story is interesting because of the personalities of the folks writing in. Weekly articles advertising a multi-session religious education course offered glimpses into the specific content for that week’s class. While people were welcome to sign up for the whole series, the weekly focus on the topic of the next class gave people new insight each week. A major fundraising silent auction wanted to build up excitement among donors and bidders, so the auctioneers sent in new stories over six weeks. Each story highlighted a different aspect of the event: one week the article solicited donations for vacation rentals, another week’s article talked about donating restaurant and home-cooked meals, and then the spotlight shifted to the fun of an auction reception with a preview of bidding. The overall theme of “silent auction” ran through each episode, but the new ideas in each story made you want to read it and find out more! Repeated articles are not nearly as fun to read as new ones on the same topic. In addition, stories that are repeated are often inaccurate! Plans and details change, and if your press information distribution system is on autopilot, you probably propagating outdated news. Cutting and pasting from past releases is kosher, but you have to sit down at the keyboard and create every time blast out a story. Finally, if you have completely run out of ideas and cannot think of a way to flog the event and make it sound interesting, maybe it’s time to stop. If you’re tired of writing about the event, people are surely tired of reading about it! I seriously do not need any commerical mention of September 11th. Really. Try as you might, I don’t think there is any way you can tastefully sneak in a reference to 9-11 in your business messages and not seem like you’re jumping aboard an emotional bandwagon for your crass commerical purpose. Businesses large and small: I want you to leave 9-11 out of your sales and client communications, okay? I have first-hand evidence that you’re having trouble steering clear of tying your business with the 9-11 anniversary. You’ve made me personally witness your weakness for cheap group hugs. As I was rushing around yesterday morning between two appointments I hustled up to a Wells Fargo ATM for a quick hit of cash. It was a normal take-the-money-and-run transaction until I’d made my selection and started the 10-second wait for the system to validate my account and spit the $20 bills at me. The ATM screen displayed a special “holiday” message as I waited for the money. 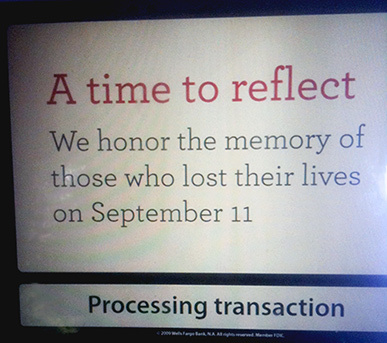 It told me it was a time for reflection and wanted me to know that Wells Fargo honors the people who died on 9-11. The bank has apparently decided that it is perfectly appropriate to use the 9-11 anniversary as a way to show their corporate good-guy Americanism. The ATM message struck me as simply wrong. On so many levels. Stop it! First, the 10-second interval while I wait for the cash to dispense is not enough time to reflect on anything serious. Certainly it’s not enough time to consider something as deep and complex as 9-11. Besides, I don’t really think that Wells wanted me to start a 9-11 reflection right then. Wells was really bragging about their own reflections on 9-11, when, frankly, they can reflect to their hearts content in private. My ATM mind is not in reflective mode, anyway. I am rushing around in my petty little errand mode. Shoving 9-11 in my face is an unwelcome intrusion. I cannot do the topic justice, and I don’t expect my ATM to be my meditation guide in any event. At best, Wells is playing on my emotions and somehow getting me to bond with Wells, as if the company were a fellow 9-11 trauma victim. Or, something more complex, subtle, or whatever. But, it boils down to Wells using 9-11 for its commerical purpose. I don’t like it. True, the message was simple and about as low-key as it could get. There was no direct attempt to monetize the 9-11 anniversary with a commemorative purchase. But, I am not ready for 9-11 to be transformed into a seasonal slogan on an ATM screen. I am not ready for it to be used by any business for any purpose. Sometimes in marketing events are too raw to try to employ them for your business. September 11th is still one of those un-commercializable events. On the 10th anniversary of the attacks, businesses do not need to tell us to reflect. Nor should they tout how much they themselves honor the dead. Some activities are best left to flesh-and-blood humans.